Links to resources for studying and teaching Biblical Hebrew. These PDF format charts are a distillation of the weak verb grammar that I used to teach, so there are some things that won’t make sense if you were not in my class. 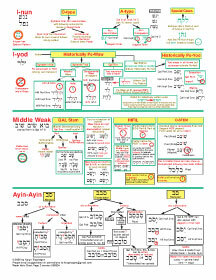 Still, if you have been through a first year Biblical Hebrew course, you should be able to figure out most of it. You may post a link to these resources, but please do not re-post the actual documents. I want to keep the most up to date versions here. 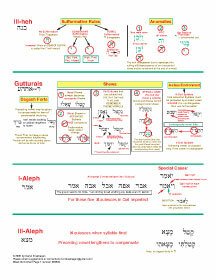 This Review Guide distills the details of first semester Biblical Hebrew into 16 pages of one-liners and charts. I teach Biblical Hebrew at a few institutions in Ontario, and am wondering if I can use your graphic illustrating voice in the binyanim in my classes? Thanks for the wonderful resources here.